UDC offers a variety of ways for you to support the next generation of our nation’s leaders. We invite you to explore this section for the best option for you. Whether you are making a pledge, giving by check, credit card, stock or real estate, you will help secure the future of our great university! Use the links below to find out more! When and how should I make my gift? Annual gifts are a high priority for UDC. Annual Legacy Fund gifts augment appropriated funds and tuition dollars where the needs are greatest. These gifts not only assist us with maintaining and enhancing existing programs, but also allow for the planning and implementation of promising new programs. UDC continues to thrive and provide quality services because of support received through the Legacy Fund! Unrestricted gifts to the Annual Legacy Fund have an immediate and significant impact, providing critical support to students in the form of scholarships and financial aid as well as subsidizing new programs, initiatives and operating expenses. Restricted Annual Gifts made to the Legacy Fund are especially meaningful because they provide much-needed operating funds that supplement appropriated funds and tuition dollars. Donors may designate their Legacy Fund gifts for specific purposes such as scholarships, support for academic departments, or technology improvements. Legacy Fund gifts may be matched by a donor’s employer through corporate matching gift programs. 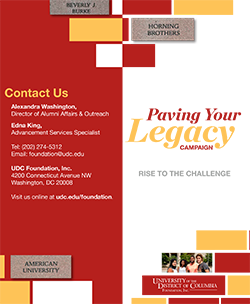 Donors should contact their employers about their matching gifts program when making a gift to UDC’s Legacy Fund. When and how often should I make my a gift to the Legacy Fund? Annual gifts can be made any day of the year – and thanks to online giving, any time of the day or night. The University’s fiscal year begins October 1 and runs through September 30. The Office of Development uses this fiscal year to determine the level of giving in a particular year. Typically, once an alum or friend makes an annual gift to the Legacy Fund, he or she will not be contacted again by the Office of Development for another gift to the Legacy Fund for the remainder of the fiscal year. However, many supporters proudly make multiple gifts to the Legacy Fund in a fiscal year. The university is grateful for your support and welcomes your gift to the Legacy Fund, whenever it is convenient for you! How can I contribute to the Legacy Fund? An outright gift is one that has an immediate benefit to the University. Cash, real estate, securities, and other assets can be given outright. As a donor, you may specify which program, department, scholarship, etc. that your gift will support. You may designate your gift to the Legacy Fund (annual fund) or to support a specific university department or program. Cash gifts are an excellent way of supporting the University. These gifts may be made with actual cash or with credit cards, checks, money orders or through direct deposit, payroll deduction, wire transfer or electronic transfer. If your gift is mailed to the Foundation before the end of the calendar year and you itemize when doing your taxes, you may be eligible for an income tax deduction for that year. Gifts of cash may be deductible for up to 50% of your adjusted gross income. Cash contributions that exceed the deduction limit may be carried over and deducted in the following five tax years. You may wish to fulfill your annual gift in two or more installments during the year. When contemplating a special gift, donors find it useful to extend their pledge over several years. The Foundation accepts pledges for as many as five years and will work with you to arrange a payment schedule that meets your needs. For more information, contact the Foundation, at 202. 274.5312 or send an email to foundation@udc.edu. Almost any marketable real estate within the United States may be contributed to the Foundation, with an equity value after selling costs estimated at $50,000 or greater. Residential real estate located outside the United States is accepted if it appears to have equity value after selling costs in excess of $100,000. Real estate accepted outright by the Foundation is immediately sold so the proceeds can benefit the university’s students, faculty, and programs. The Foundation accepts securities which are traded on the New York, American, NASDAQ, or Pacific Coast Stock Exchanges. The Foundation values a gift of stock, bonds or mutual funds (per IRS regulations) at the mean value on the date of transfer to the Foundation. The Foundation gives the donor credit for the gift at this value, not the value realized by the ultimate sale of the asset. The Foundation defines the date of transfer as either the date a security is received in its account at its brokerage house, Morgan Stanley, directly from the donor’s account, or the postmark date on the envelope when the donor mailed the certificates. Advise your broker in writing that you wish to make a gift to University of the District of Columbia Foundation, Inc. Specify the number of shares or values of each stock to be given. Send a copy of this communication to Director of Development, Office of University Relations, University of the District of Columbia, 4200 Connecticut Avenue, NW, Washington, DC 20008; or via email to foundation@udc.edu or fax at 202.274.6411. The Office of Development will continue to guide you through this convenient process. The University of the District of Columbia Foundation, Inc. is a 501(c) 3 organization. Its tax ID number is 52-1152624. Please contact the Foundation at 202.274.5312, if you would like information on gifts of other assets. You may also email us at foundation@udc.edu. Making a gift through your will is perhaps the easiest way to provide meaningful support. It can be as simple as adding a codicil to your current will. You can state a specific dollar amount, specific property, or a percentage of your estate. There are several ways to give a life insurance gift. You may give a fully paid policy naming the Foundation as the beneficiary. You may transfer ownership of a policy that is not fully paid and continue to pay the premiums, or you may purchase a new policy and name the Foundation as owner and beneficiary. Making a gift to the UDC Foundation through a charitable trust allows you to provide current income to yourself or someone you care about. At the end of the trust period, the trust’s assets become the property of the Foundation. The Director of Development will work with you and your legal and financial counsel to help you to achieve your philanthropic goals. You may arrange to support the University in perpetuity through an endowed gift to the UDC Foundation. Endowed gifts may be made through any of the current or deferred giving vehicles mentioned above. Contact us at foundation@udc.edu for more information.